No sooner had we gone to press with our review of Focusrite’s Clarett OctoPre than the company announced a new ADAT expander pairing, the Scarlett OctoPre and Scarlett OctoPre Dynamic. These new units each sport eight mic/line inputs (two of which can be used as high-impedance instrument inputs), eight line outputs and eight channels of ADAT digital output, and the Dynamic version also boasts eight ADAT inputs. If this all sounds very familiar, your memory isn’t fooling you: these devices follow the same template as the OctoPre MkII and OctoPre MkII Dynamic, which I reviewed back in SOS March 2010 (http://sosm.ag/octopre-mk2), and which are replaced by these new units. I was sent the Scarlett OctoPre Dynamic for review. So, what’s new? Well, physically, the control layouts have changed slightly, but there’s nothing particularly unusual in the new configuration. Aesthetically, everything more closely resembles Focusrite’s Scarlett range of audio interfaces, as you’d expect. While this perhaps clears up any confusion about the different classes of interface/preamp in the company’s range, it’s not just a stylistic point: if you’re adding one of these to an existing Scarlett 18i20 interface, having a consistent control set across both units will make operation that little bit more intuitive. Not all of the change is skin-deep. For starters, while the quality of the converters is pretty much on a par with what went before, they support more and higher sample rates. The OctoPre MkII range could handle eight channels at 44.1 or 48 kHz, or four channels at 88.2 or 96 kHz, whereas this new Scarlett version can convert eight channels at up to 96kHz and four channels at up to 192kHz. The mic preamps don’t seem to have changed a great deal, but that’s not something to complain about, as these are among the best mic preamps you’ll find at this price per channel. (As with the Scarlett interfaces, the preamp design has its origins in the old Platinum range, and the development of the design is discussed in the OctoPre MkII review I linked to earlier). They’re not the kind of preamps you’d really want to drive into distortion for ‘colour’, but if you want to capture something cleanly you’d have to pay considerably more for a worthwhile improvement. Usefully, the instrument inputs on the new unit benefit from increased headroom. On the back panel of the Dynamic model, the word-clock input of the MkII range is joined by a word-clock output. This allows you to slave other devices to this unit’s internal clock — a useful addition for anyone wanting to integrate this into a system with multiple digital devices, if the ADAT sync doesn’t offer what you need. The analogue inputs are all presented as ‘combi’ sockets, with mic/line signals coming in via XLR, and line (and line/instrument for channels 1+2) sources also coming in via jacks. The analogue outputs on the Dynamic model are presented as TRS jacks, again on the rear. It’s worth noting that on the standard (non-Dynamic) model, inputs 1 and 2 are presented on the front panel, which is useful but probably would have been trickier to accommodate on the Dynamic, due to the need to host the compressor controls. As before, the basic model offers only one-way (analogue-to-digital) conversion. That’s fine if you simply wish to hook up an additional bank of preamps to your interface to, say, record a rock band with a multi-miked kit. However, it does mean you’re unable to use the Scarlett OctoPre to hook up extra outboard to your DAW. To do that, you’d need the Dynamic model, because as well as the obvious addition of the analogue compressor on each channel, this features both A-D and D-A conversion — you can route your DAW outputs to the Scarlett OctoPre Dynamics’s line outputs, as well as route its line inputs back to the DAW. I can see why Focusrite have taken this decision: it makes sense to make the more basic model as affordable as possible, and there will be people who want additional mic/line/instrument inputs (so they’re able to capture multitracks of a full band) but need nothing more. But this does mean that anyone wanting an ADAT expander to hook up, say, some external analogue compressors must also pay for the on-board compressors of the OctoPre Dynamic! If that describes your own situation, then it’s worth noting that the company’s Scarlett 18i20 audio interface sits in between the two Scarlett OctoPres in terms both of price and features, and that this can be configured for operation in stand-alone mode as a two-way ADAT converter, using the bundled Focusrite Control software (the only real trade off is that you can’t change the sample rate via the front panel). The inputs and outputs of the Scarlett OctoPre Dynamic are all presented on the rear panel, with ‘combi’ XLR/jack sockets catering for the analogue inputs. Hooking the Scarlett OctoPre Dynamic up to my RME Fireface 800 interface via ADAT was simplicity itself. The ports are clearly labelled and have useful protective hinged doors that prevent dust getting in when the cable’s not connected (I’ve lost more of the fiddly removable optical-port dust caps over the years than I care to remember!). The Sync button on the front enabled me to select the sync source, the options being internal, ADAT or word clock. All three worked just fine, so long as I took care to set the RME interface accordingly. If using the OctoPre as your primary converter, it makes sense to use the OctoPre’s internal clock, and set your interface to sync via ADAT or word clock. For me, sync’ing via ADAT worked reliably, so unless you’re distributing clock signals to multiple units, you probably won’t need to hook up any word-clock cables. The sample rate is selected in the same way with an adjacent button. You can choose any of the standard rates from 44.1kHz to 192kHz, though note that for eight channels of audio above 48kHz you’ll need to hook up both (pairs of) ADAT ports, so the unit can use the S/MUX protocol to split the channels over two optical connections. As I’d anticipated, testing the mic preamps revealed a good, clean sound, with the levels being clearly indicated by the five-segment input meter for each channel. The gain knob has a slightly rubbery feel, which makes it really easy to grip and adjust, and there was a useful degree of control over the whole range of the pot. I was a little disappointed to discover that 48V phantom power is switchable only in two banks of four — ideally, I’d have preferred it to be individually set for each preamp, but that would no doubt add to the price, and having two switchable banks isn’t the end of the world. Testing the line inputs by feeding the outputs of some 500-series mic preamps into the Scarlett OctoPre Dynamic revealed similarly clean-sounding results, whether via the XLR or jack connector of the ‘combi’ socket. The instrument inputs sounded fine too, and having the instrument-level switches for channels 1 and 2 on the front panel is a good idea. Unfortunately, integrating the instrument inputs themselves into those rear-panel ‘combi’ sockets is less ideal. As this is a rackmount device, I think it’s reasonable to expect that some users will want to be able to plumb the OctoPre in to their rack and patchbay, and forget about it. If you’re only using mic/line inputs that’s fine, as you’d use XLR connectors; and if you wanted only the line/instrument inputs, you’d use jacks. But you don’t have the ability to switch between mic and instrument inputs in this way, without unplugging and replugging the unit. By contrast, the non-Dynamic model, which obviously doesn’t have all those compressor controls to accommodate, presents inputs 1 and 2 on the front panel, making the instrument inputs more accessible. This is a minor gripe in the grand scheme of things, though, and it won’t be shared by everyone. For example, anyone who’s planning to use the OctoPre Dynamic outside a rack, or perhaps in a portable rack case with a removable rear lid for location recording purposes, will have no problem. And it’s worth bearing in mind that many interfaces you might hook this OctoPre up to (for instance, Focusrite’s Scarlett 18i20 that I mentioned earlier) will already feature one or two dedicated instrument inputs. This just leaves the compressors on the Dynamic model to consider and, to be honest, I couldn’t discern any significant change — it’s essentially the same good-sounding, if rather Spartan, VCA-based one-knob compressor that adorned the OctoPre MkII Dynamic, whereby the ratio seems to increase the more the signal exceeds the threshold. It’s not the sort of thing I’d be making the effort to route audio out of the box for, but it would be perfectly possible to apply gentle compression when recording (perhaps to tame multi-miked drums), or to use as ‘safety’ limiters when recording on location, in situations where levels might be less reliably predictable. And the bright-yellow single-LED meter that indicates when gain reduction is taking place is sufficient to suggest when you might be taking things too far. My minor issue with the instrument inputs aside, I have no hesitation in recommending the Scarlett OctoPre Dynamic. Sure, more money can buy you better preamps (not least from Focusrite’s own Clarett and ISA ranges) but you’d have to spend quite a bit more to secure a worthwhile improvement. In short, if you find yourself unable to make good-sounding recordings with the OctoPre range, the problem isn’t with the equipment! The only question, then, if you’re considering acquiring something like this, is what you need from your ADAT expander. 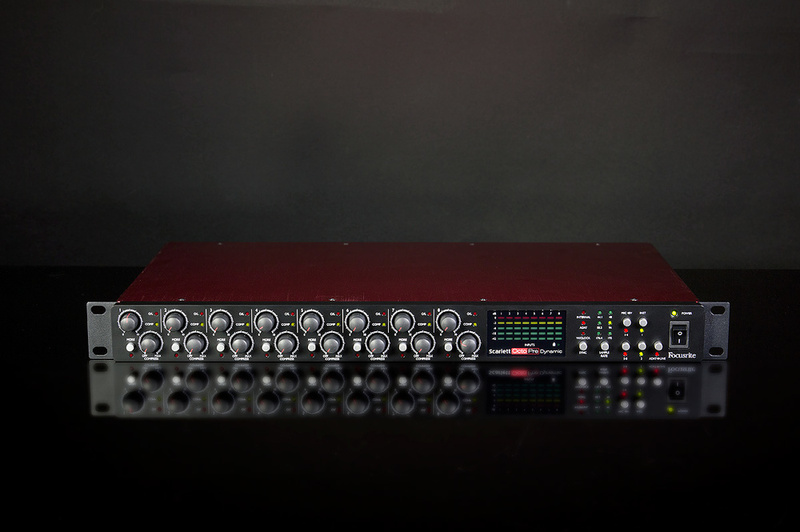 For mic preamps alone, the Scarlett OctoPre ticks all the right boxes. If you want two-way ADAT conversion and on-board analogue compressors, the OctoPre Dynamic offers these. And if you want the two-way conversion without the compressors, you might consider setting up a Scarlett 18i20 as a stand-alone converter. Somewhere in their three ranges, there’s a good chance that Focusrite have something that fits your budget and will cater to your needs! I’m not aware of any other ADAT expander mic preamps that offer the on-board analogue compression, but for the preamps and conversion alone, you could consider offerings from PreSonus, Behringer and Midas. A higher budget brings into contention models from Audient and RME, as well as Focsurite’s more upmarket model, the Clarett OctoPre. But not all of these offer the Dynamic’s two-way conversion. Focusrite’s Scarlett 18i20 audio interface can be used in standalone mode as an ADAT A-D/D-A converter, and this features two front-panel mic/line/instrument inputs. Still boasts great preamps and conversion for the per-channel price. Instrument input benefits from increased headroom. More sample rates than previous generation of OctoPre. You must choose between mic/line or line/instrument inputs when using a patchbay — you can’t have all three. A worthwhile update to Focusrite’s range of ADAT-equipped mic preamps. Scarlett OctoPre £399.99; Scarlett 18i20 £449.99; Scarlett OctoPre Dynamic £599.99. Prices include VAT. Scarlett OctoPre $399.99; Scarlett 18i20 $449.99; Scarlett OctoPre Dynamic $599.99.